xkcd is a webcomic of "romance, sarcasm, math, and language". There is a wiki to help you understand the comics if they are too geeky. 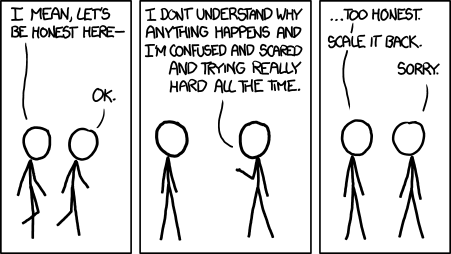 Created by Randall Munroe. SMBC covers everything from superheroes to existentialism. Created by Zach Weinersmith. Dilbert is about life in a cubicle. Created by Scott Adams. There have been controversies surrounding his persona. Matt Bors webcomics is about US "politics and ridicule". 'Murica FTW. He traveled for one month through Afghanistan, his first trip outside the US, to see how things are over there. He is also into comics journalism, for instance, concerning the Haiti earthquake aftermath. The Oatmeal, created by Matthew Inman. He is very funny when it comes to legal disputes. Really, really funny.